Just under 2,000 Plymouth Superbirds were ever produced in all of their too-high rear spoiler glory. Finding one of these for sale is rare enough, and finding two almost never happens. And yet! Here we have two up for auction, true barn finds if you believe the seller, both with under 50,000 miles. 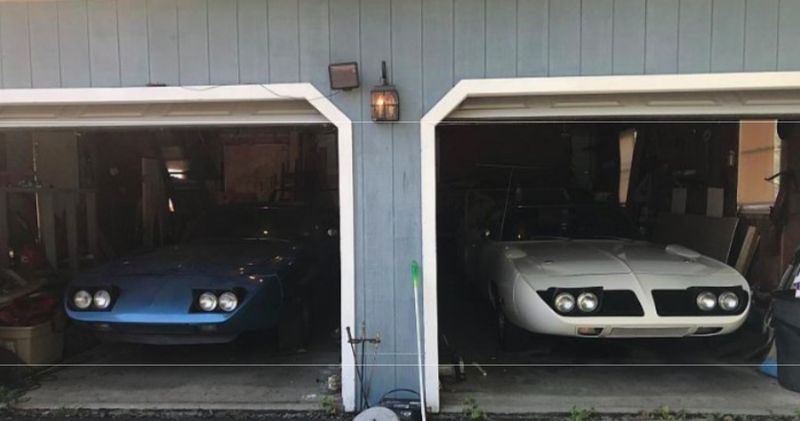 The eBay seller says that the owner of the two Superbirds approached them after they had purchased a different Superbird at an auction in Maine in August. Just after I won the blue 1970 Super Bird with white bucket seat interior a man approached me and sat down next to me and stated he has 2 Super Birds in storage that he has owned for the last 40 years. He told me he purchased them from the original owners. He said one was B5 blue with white bucket seats like the one I just purchased at Owls Head Museum and the other Super Bird was an Alpine White with black bucket seats with console auto slap stick. My heart was still racing after just winning the auction at Owls Head and now it looked like I had the rare opportunity to purchase two more Super Birds that have been hidden from the public eye for over 35 years. He told me he would like to sell both as a pair and that he could show them to me in five days. So I made an appointment to meet with him in five days to view both birds. He stated that both cars were sold brand new in 1970 at Blouin Chrysler Plymouth Dodge in Augusta Maine just 10 miles from his home. He remembered both cars when they were new at Blouin Chrysler Plymouth Dodge. He knew both first original owners and when the time was right he purchased both Birds from each of the original owners, he said around 1978. When the eBay seller got there he found what you see above: The two Superbirds, headlights up, just chillin’. Neither car runs, but the seller says that they’re not damaged in any significant way, and have been in dry storage for close to four decades. The blue Superbird has 27,416 miles and the white one 42,497 miles, according to the seller. The seller cleaned up both cars, but says they’ll leave the work of fully restoring the cars to whomever buys them. The interior is original on both cars. Both vinyl roofs are very high grade original condition. The padded dash’s on both cars are as nice as you will ever find with no cracks or blemishes. Both trunks are spotless untouched rust free on both cars as seen in the photos. The floors and trunks were under coated from day one with thick Ziebart under coat at the dealership and are solid rust free. The tag for the Ziebart under coating is still on the door and window on the white car and it was done at the dealership in 1970 with the mileage tag still on the door. The blue car had Rusty Jones under coat done at the dealer ship in 1970 the owner told me at extra cost just like the white bird. When you scrape the under coat off the floors on the under side the metal still looks like new. Both cars will need the typical maintenance like any car that has been in dry storage for almost 40 years. Brakes, exhaust, motor service, fluid changes, filters, transmission fluid’s, etc. Its amazing the brakes still work fine on both cars. I put a spare battery I had into both cars and low and behold all the lights came on as you can see in the pictures, head lights, side markers, interior lights brake lights etc. Please note both cars will need a new battery. As of this writing, each cars bids were up to just over $125,000, though Hagerty says they’re likely worth double that. You can check out the listings (and see a bunch more photos) here and here.